Copyright Photo: Jay Selman/AirlinersGallery.com. Republic Airlines’ (2nd) Embraer ERJ 170-200LR (ERJ 175) N115HQ (msn 17000182) departs from the Charlotte hub. 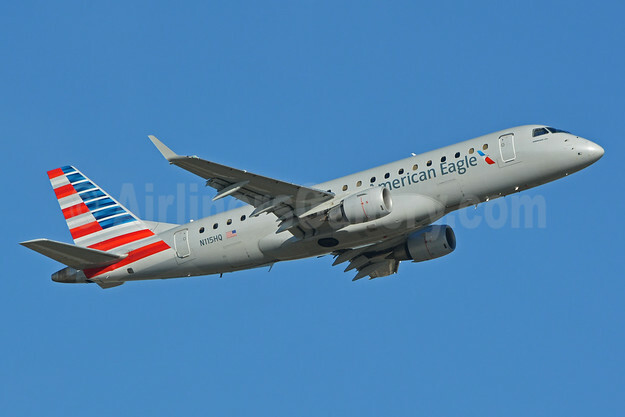 This entry was posted in American Airlines, American Airlines Group, American Eagle and tagged 17000182, Air Wisconsin, American Airlines, American Airlines Group, American Eagle, Charlotte, CLT, E175, Embraer, Embraer 175, Envoy Air, ERJ 170-200LR, ERJ 175, N115HQ, PSA Airlines, Republic Airlines on December 16, 2015 by Bruce Drum. Mesa Airlines, Inc. (Phoenix) has announced the expansion of its agreement with United Airlines (Chicago) to operate three additional Embraer 175 aircraft, bringing the total number of United Express aircraft operated by Mesa to 68. In October, the Company announced an agreement for the addition of 15 new aircraft scheduled for delivery in 2016, which has now increased to 18. Mesa currently operates 30 Embraer E175 aircraft and 20 Bombardier CRJ700 aircraft under the United Express brand. The E175’s 76-seat dual-class configuration features 12 First-Class, 16 Premium Economy and 48 Coach seats. The aircraft has Inflight Wi-Fi connectivity, leather seating and electric outlets in First Class. Mesa Airlines currently operates as American Eagle from hubs in Phoenix and Dallas/Fort Worth and as United Express from Washington Dulles and Houston. Founded on a mesa in New Mexico in 1982 by Larry and Janie Risley, Mesa currently operates 115 aircraft, with more than 530 daily system departures to 103 cities, 38 states, the District of Columbia, Canada and Mexico. Copyright Photo: Brian McDonough/AirlinersGallery.com. Embraer ERJ 170-200LR (ERJ 175) N84307 (msn 17000419) departs from United’s Washington Dulles International Airport hub. 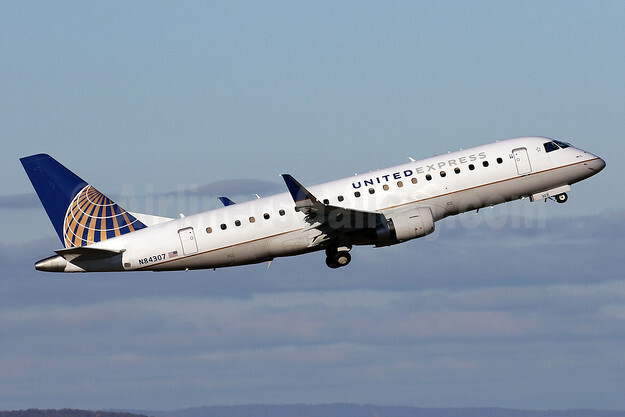 This entry was posted in Mesa Airlines, United Airlines, United Express and tagged 17000419, Dulles, E175, Embraer, Embraer E175, Embraer ERJ 170-200LR, Embraer ERJ 175, ERJ 170-200LR, ERJ 175, IAD, Mesa Airlines, N84307, United Airlines, United Express, Washington on December 12, 2015 by Bruce Drum. Compass Airlines is pleased to announce that the Collective Bargaining Agreement (CBA) for its pilot group has been amended to increase first year, First Officer pay to $35.81 per flight hour. An additional highlight of the amended CBA is the provision of four paid hotel stays per month for commuting pilots. The amendment also gives Compass the flexibility to quickly raise first year pay in response to market conditions. The agreement was reached as part of a voluntary mediated settlement of a number of outstanding issues between Compass Airlines and its pilot group, represented by the Air Line Pilots Association (ALPA). The amendments to the contract are effective immediately. Copyright Photo: Michael B. Ing/AirlinersGallery.com. Compass Airlines Embraer ERJ 170-200LR (ERJ 175) N638CZ (msn 17000259) departs from Los Angeles International Airport (LAX). This entry was posted in Compass Airlines, Delta Connection and tagged 17000259, Compass Airlines, Delta Connection, E175, Embraer, Embraer 175, ERJ 175, LAX, Los Angeles, N638CZ on December 2, 2015 by Bruce Drum. SkyWest, Inc. (SkyWest Airlines and ExpressJet Airlines) (St. George, Utah) today reported financial and operating results for the quarter ended September 30, 2015. SkyWest generated $36 million of net income for Q3 2015, or $0.71 per diluted share. Excluding special items, SkyWest’s net income for Q3 2014 was approximately $26 million, or $0.50 per diluted share. Operating income for Q3 2015 was $78 million, an increase of 32% from Q3 2014 of $59 million. SkyWest reported $77 million of net income for the nine months ended September 30, 2015, or $1.49 per diluted share, a $88 million improvement from the corresponding period of 2014, which had net loss of $11 million, excluding 2014 special items. Under its fleet transition, SkyWest generated approximately 24,800 additional block hours with its dual class aircraft (CRJ700s/900s and E175s) during Q3 2015, compared to Q3 2014. SkyWest also had a reduction of approximately 89,000 block hours with its less profitable 50-seat and smaller aircraft (CRJ200s, ERJ145s/135s and EMB120s) during Q3 2015, compared to Q3 2014. Under an agreement announced in Q3 2015, SkyWest Airlines is scheduled to place 18 additional new E175 aircraft into service with United, with anticipated scheduled delivery dates from Q4 2016 to Q2 2017. SkyWest Airlines is currently scheduled to have a total of 58 E175s in service with United by the end of Q2 2017. Under a previously announced agreement, SkyWest Airlines is scheduled to take delivery of twelve new E175 aircraft for Alaska from Q4 2015 to Q4 2016. SkyWest is currently scheduled to have a total of 15 E175s in service with Alaska by the end of Q4 2016. 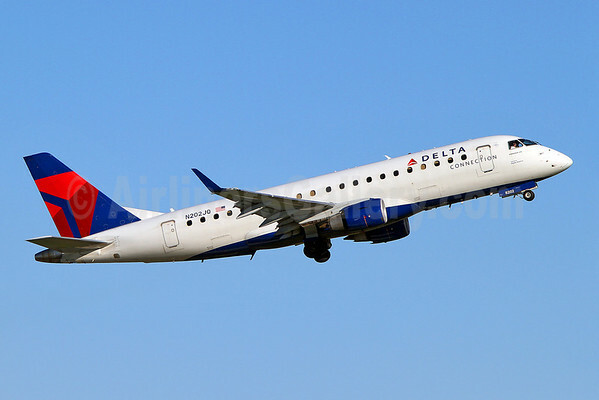 Under an agreement announced last week, SkyWest Airlines is scheduled to take delivery of 19 new E175 aircraft for Delta from Q3 2016 through mid-2017. Copyright Photo: Tony Storck/AirlinersGallery.com. 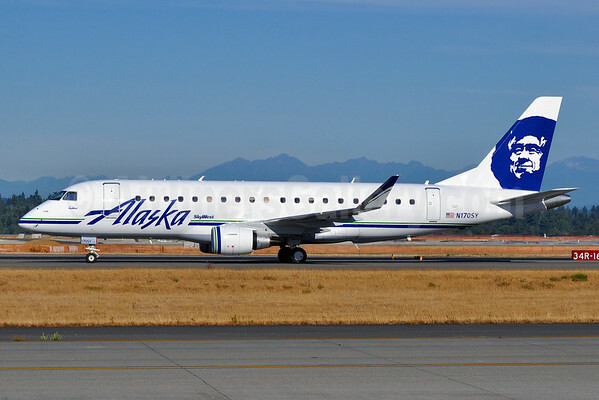 SkyWest Airlines is already operating the Embraer 175 for Alaska Airlines. Alaska Skywest-titled Embraer ERJ 170-200LR (ERJ 175) N170SY (msn 17000483) taxies at Seattle-Tacoma International Airport (SEA). This entry was posted in SkyWest Airlines and tagged 17000483, E175, Embraer, Embraer 175, Embraer ERJ 175, ERJ 170-200LR, ERJ 175, N170SY, SEA, Seattle/Tacoma, SkyWest, SkyWest Airlines on October 28, 2015 by Bruce Drum. 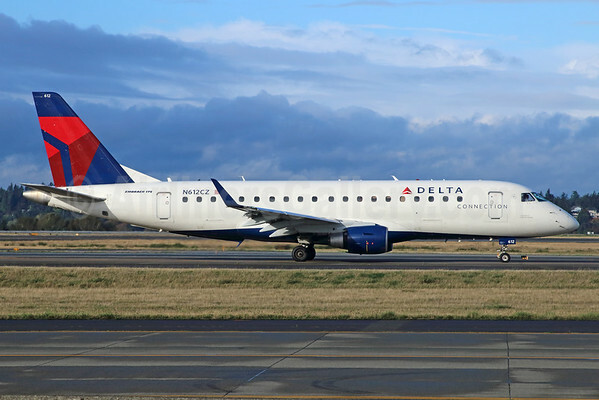 Delta Air Lines (Atlanta) will added Embraer 175 Delta Connection service (operated by Compass Airlines) between its Seattle/Tacoma hub and Orange County (John Wayne) starting on May 1, 2016. Delta Air Lines’ hub at Seattle-Tacoma International Airport will continue to grow next spring with the launch of four daily flights to Orange County’s John Wayne Airport beginning May 1, 2016. In all, Delta will launch service to ten destinations from Seattle/Tacoma between November 2015 and May 2016: Billings, Montana. ; Boston; Cancun, Mexico; Edmonton, Alberta; Kona on Hawaii’s Big Island; Missoula, Montana; Orange County; Orlando; Pasco, Washington; and Victoria, British Columbia. Some service may be operated by Delta Connection carriers SkyWest Airlines and Compass Airlines. Delta’s Seattle/Tacoma to Orange County flights will be operated by Delta Connection carrier Compass Airlines using Embraer 175 aircraft. In other news, Delta will operate weekly Boeing 737-800 Cuban charters from Atlanta to Havana starting on April 2, 2016. Copyright Photo: Michael B. Ing/AirlinersGallery.com. Compass Airlines’ Embraer ERJ 170-200LR (ERJ 175) N612CZ (msn 17000201) taxies to the runway at Seattle-Tacoma International Airport. This entry was posted in Compass Airlines, Delta Air Lines, Delta Connection and tagged 17000201, Atlanta, Compass Airlines, Delta Air Lines, Delta Connection, E175, Embraer, Embraer 175, ERJ 170-200LR, ERJ 175, havana, N612CZ, Orange County, SEA, Seattle/Tacoma on October 19, 2015 by Bruce Drum. Republic Airways Holdings Inc. has been made aware of a complaint filed by Delta. The Company has not been served and has not received the full complaint and therefore cannot comment further on the matter at this time. Republic can confirm that the Company is not in breach of any of its capacity purchase agreements with any of its mainline partners, including both Delta Connection Agreements. Republic Airways Holdings Inc., based in Indianapolis, Indiana, is an airline holding company that owns Republic Airlines and Shuttle America, collectively called “the airlines.” The airlines operate a combined fleet of about 240 aircraft and offer scheduled passenger service with approximately 1,250 flights daily to about 100 cities in the U.S., Canada and the Caribbean through fixed-fee flights operated under our major airline partner brands of American Eagle, Delta Connection, United Express and US Airways Express. The airlines currently employ about 6,500 aviation professionals. Copyright Photo: Keith Burton/AirlinersGallery.com. Shuttle America Embraer ERJ 170-200LR (ERJ 175) N202JQ (msn 17000240) in Delta Connection colors climbs away from Boston’s Logan International Airport. This entry was posted in Delta Air Lines, Delta Connection, Republic Airways Holdings, Shuttle America and tagged 17000240, BOS, Boston, Delta Air Lines, Delta Connection, E175, Embraer, Embraer 175, Embraer ERJ 175, ERJ 170-200LR, ERJ 175, N202JQ, Republic Airways Holdings, Shuttle America on October 8, 2015 by Bruce Drum. 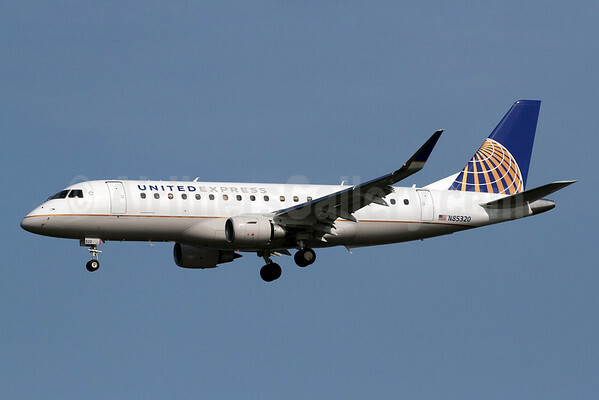 Mesa Airlines, Inc. (Phoenix) has announced an agreement with United Airlines (Chicago) to add 15 Embraer 175 aircraft to Mesa’s United Express fleet. Mesa currently operates 30 Embraer aircraft for United Airlines. In addition to the E175s, Mesa operates 20 Bombardier CRJ700 aircraft under the United Express brand. Copyright Photo: Brian McDonough/AirlinersGallery.com. Mesa Airlines’ Embraer ERJ 170-200LR (ERJ 175) N85320 (msn 17000454) arrives at Washington Reagan National Airport (DCA). 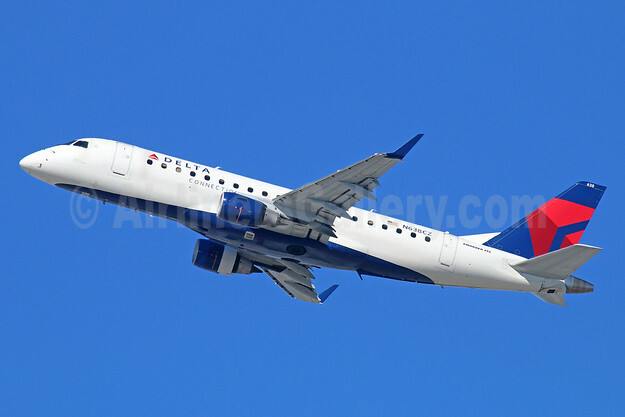 This entry was posted in Mesa Air Group, Mesa Airlines, United Express and tagged 17000454, E175, Embraer, Embraer 175, ERJ 170-200LR, ERJ 175, Mesa Airlines, N85320, United Express on October 7, 2015 by Bruce Drum.